i plugged my 2tb western digital my passport (fat32, one partition) into a friend's windows xp computer tonight. the computer could not read the drive, and my mac can't either now. 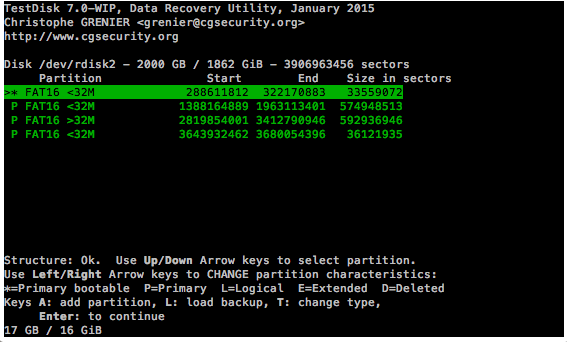 here's the log from testdisk & a screenshot. There are I/O errors. You disk probably contains bad sectors. It's a physical problem so it shouldn't be caused by using the disk on an XP, probably a mechanical or electric shock. ok i ran ddrescue. i did not try and wipe the new drive beforehand and just overwrote, i hope that is not a problem. here is the log from running testdisk on the new drive. Warning: the current number of heads per cylinder is 1 but the correct value may be 8.
ddrescue could not save 4096 bytes of the drive. i did retry passes with no luck. that's the size of an advanced format sector, isn't it? i don't know, maybe that will help. if in any case testdisk can't do anything and you know of other routes to try, please let me know. at this point i'm concerned about the data but have accepted that i may have lost it- on the other hand i'm enjoying learning about this process, so if there's something else i can i do to continue i'd like to know. Use knoppix live dvd to save data. and dont do things before getting advice. did i do anything i should not have or is that advice for the future? ok, seeing as you recommend knoppix to everyone regardless of their problem im going to assume you didnt even read my logfile..